Looking for free resources? Browse the collection or search by category or keyword. Keep an eye on this collection, as we'll updating with new content regularly. StEPs Welcome or Refresher is an AASLH continuing education event presented by Cherie Cook, AASLH Senior Program Manager. All organizations enrolled in StEPs are invited to take part in this free orientation/refresher webinar to learn three different approaches for using the workbook, how to access the StEPs website, getting recognition for progress made by your organization, and more. This webinar is only for organizations that have paid the StEPs enrollment fee. 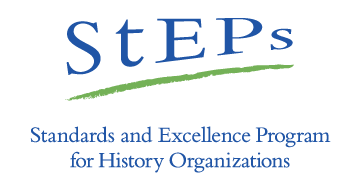 Organizations considering the program are invited to watch the “Is it Time for Your Organization to Enroll in StEPS?” webinar recording at https://aaslh.org/programs/steps/ or register for the live event on May 1, 2019 at https://learn.aaslh.org/p/event-stepsready-2019may. 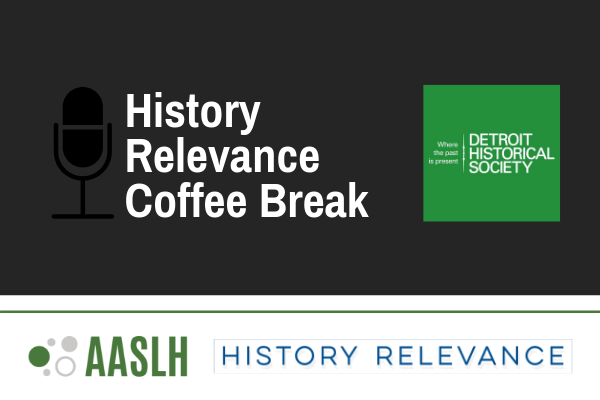 History Relevance Coffee Break with Detroit Historical Society is an AASLH Continuing Education online event on May 9, 2019. This live webinar is about how the Detroit Historical Society is making history relevant by connecting the past to the present. This webinar is presented by Kalisha Davis and Max van Balgooy and is part of the History Relevance Coffee Break webinar series, presented in partnership with the History Relevance initiative. Is your organization ready for StEPs? is an AASLH continuing education event presented by Cherie Cook, AASLH Senior Program Manager. Join us for this free, one-hour webinar to hear how StEPs can help your organization create a road map for meaningful change. This webinar is for organizations that are considering using the StEPs program. Organizations already enrolled in the program should register for the free webinar, “StEPs Welcome (or Refresher). History Relevance Coffee Break with Ford's Theatre is an AASLH Continuing Education online event originally presented live on December 13, 2018. This webinar is about how the Ford's Theatre is making history relevant by connecting the past to the present. This webinar is presented by David McKenzie and Conny Graft and is part of the History Relevance Coffee Break webinar series, presented in partnership with the History Relevance initiative. 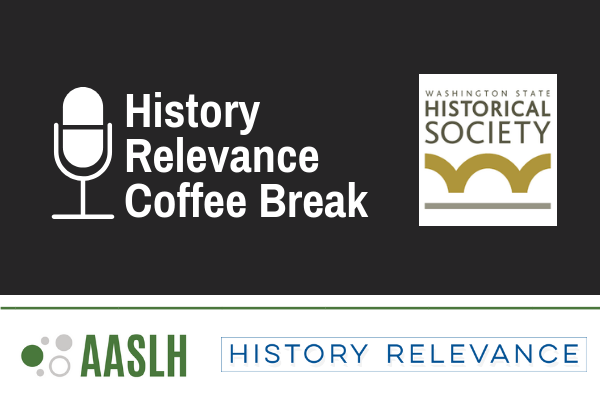 History Relevance Coffee Break with Washington State Historical Society is an AASLH Continuing Education online event on November 29, 2018. This live webinar is about how the Washington State Historical Society is making history relevant by connecting the past to the present. This webinar is presented by Gwen Whiting and Elisabeth Marsh and is part of the History Relevance Coffee Break webinar series, presented in partnership with the History Relevance initiative. Making History Relevant is an AASLH Continuing Education recorded webinar. This webinar is about how history can have more impact when it connects the people, events, places, stories, and ideas of the past with those that are important and meaningful to audiences today. This event is presented by John Dichtl. This publications features new and creative ideas for generating new revenue at your institution, no matter its size. Developed from recommendations from around the field, this publication is sure to spark inspiration! The College Art Association has created a useful guide to navigating the tricky situations about copyright and reproducing images at your site. Create.Connect, an indoor, year-round exhibition for families at Conner Prairie, was created in 2014 to weave together history and STEM through the use of hands-on activities, historical settings and live facilitation. It’s a testing ground for new ways to integrate history and STEM with the goal of making our nation’s history museums and sites new venues for learning about science, technology, engineering and math. “A Call for Gender Equity in the Museum Workplace” discusses the history of museum workplace discrimination in hiring, promotion, and pay and calls for museums to make equality a priority through fair and transparent policies. Strengthening Networks, Sparking Change: Museums and Libraries as Community Catalysts combines findings from a literature scan and input from the library, museum and community revitalization fields with case studies about the experiences and vision of museums and libraries working to spur change in their communities. To encourage more audience research and evaluation in history institutions, the AASLH Visitors’ Voices group compiled an annotated list of print and electronic resources to help colleagues begin or expand their audience research and evaluation efforts. The Delaware Division of Historical and Cultural Affairs’ Collections Policy serves as a useful model for historical agencies managing collections. The Historical Society of Central Florida’s Deed of Gift Form serves as a useful model for organizations updating or creating a new form, and to use with donations to the organization. This deaccession form ensures all the proper procedures for deaccessioning an object have been completed and provide documentation for this process. This form is a useful model for collecting organizations drafting a new or updating an old incoming loan form. This donor questionnaire from the Historical Society of Central Florida provides space for thorough documentation of an object’s history, including information on all previous owners, what the object is made of, and how the object was used. The Chester County Historical Society’s volunteer handbook outlines the history of the organization, policies and procedures of the organization, the committees and projects volunteers can serve or work on, and the floor plan of the history center. The Historical Society of Central Florida provides a detailed temporary custody receipt that contains all the crucial components to acknowledge items have been received. This Object Tracking Form can be used to log the date, items, location, reason, and authority for moving, removing, and returning objects into an institution’s collection. This is a sample incoming condition report for objects in a historical organization's collections. This is a sample outgoing condition report for objects in a historical organization's collections. This resource is a generic form from Marketo that will aid in social meeting marketing for events. This ethics position paper is designed to provide guidance to institutions considering the future of their organization and the potential repurposing of a historic house/site. This Ethics position paper provides practical guidelines for interpreting, adopting and implementing the Association’s position on the ethics of dissolution or closing of a history museum.